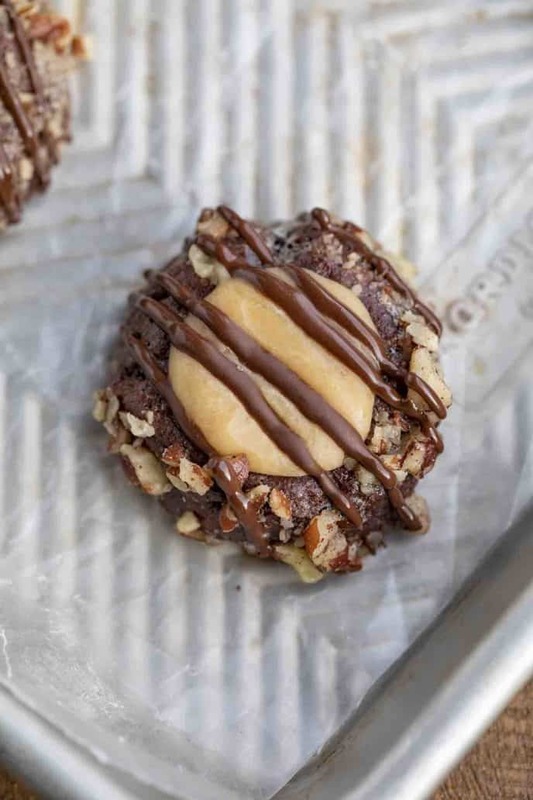 Turtle Cookies are chocolate cookies rolled in pecans, topped with caramel, and drizzled with melted chocolate. The PERFECT combo of sweet and chewy! 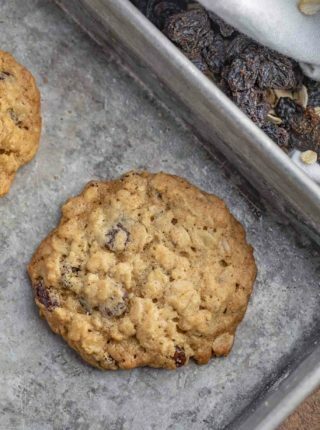 We always have fresh baked cookies in our kitchen, and right now we’re making Chocolate Chip Cookies, Lemon Cookies, and Oatmeal Raisin Cookies! 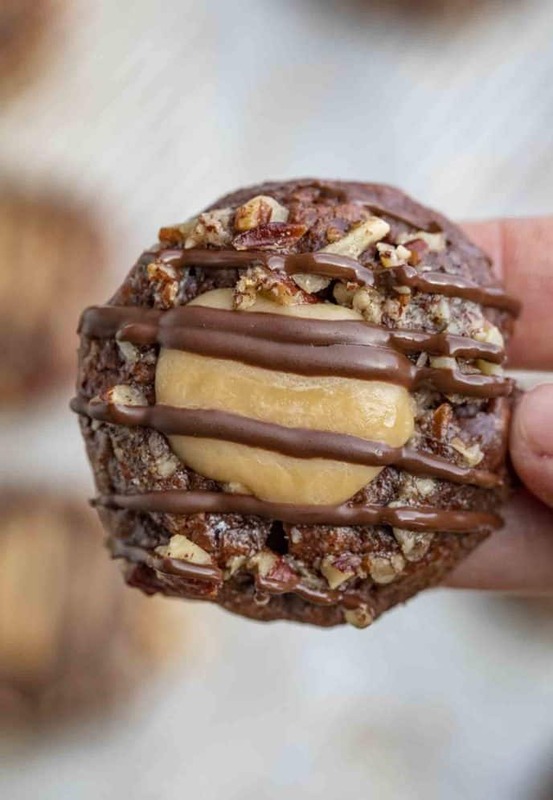 Turtle Cookies are one of my favorite cookie recipes to make, made with cookie dough rolled in egg whites and crunchy pecans, then baked and topped with caramel and chocolate drizzle. These cookies are named for their turtle-like appearance, similar to my Pretzel Turtles. They’re insanely easy to make, and are always requested when I’m working on recipes with caramel. 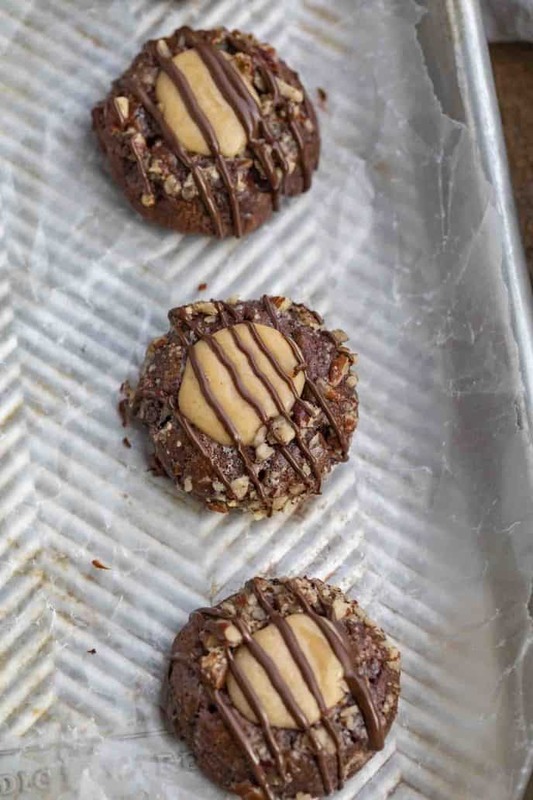 Turtle cookies are rolled in pecans, but you can use any nuts like peanuts, walnuts, or almonds. You can also sprinkle the nuts on top after adding the caramel and chocolate, instead of rolling the turtles. I like to use dark chocolate chips to make the chocolate drizzle, but you can use milk chocolate or white chocolate chips. Also, try filling the thumbprint with chocolate, and drizzling with caramel. 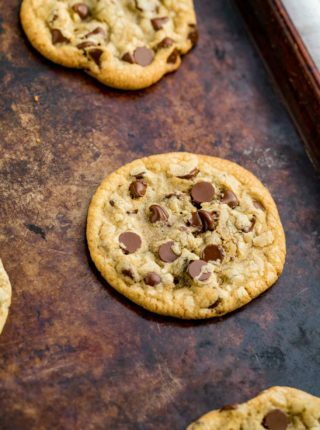 You can also add a sprinkle of sea salt to the top of these cookies, right after adding the chocolate, for a sweet and salty flavor. Turtle cookies can be stored on the counter, or frozen if you want to make them ahead. Either way you keep them, I recommend using layers of parchment or wax paper between the cookies to keep them from sticking together. If I freeze these cookies, I like to wrap them in foil as well, to make sure they are sealed tightly. You can also freeze the dough to bake with later. If you’re going to do this, roll the tablespoon-sized balls and place on a baking sheet, then freeze for 1 hour. After the dough is frozen, move the balls to an airtight container and freeze. When you’re ready to bake, you can roll the cookies in the egg whites and pecans and go straight to the oven without defrosting. They may need an extra few minutes of cooking time before you can add the caramel. HOW LONG WITH TURTLE COOKIES KEEP? Turtle cookies will last on the counter in an airtight container for 4-5 days, or frozen for 2-3 months if you want to make-ahead. 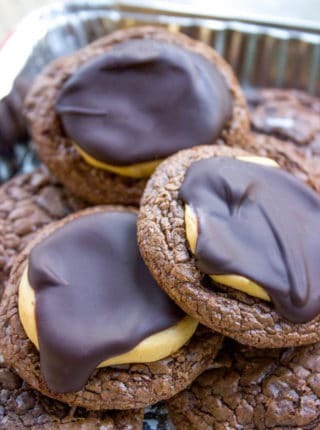 This recipe calls for leaving a thumbprint in the cookie, which is meant to be filled with caramel later. I like to use a teaspoon for this, because the cookies are going to be hot the second time you have to make the indent. You can also drizzle these cookies with some of my homemade caramel sauce. I usually like to use caramel candies for this recipe, because they will harden better, holding the caramel to the top of the cookie. I recommend lining your baking sheet with parchment paper, to stop your turtles from sticking to the pan. It is important to refrigerate your dough because these are drop cookies, meaning they flatten in the oven. If the butter in the dough is too cold, they will flatten too much and dry out. The colder you can get the dough, the better. This recipe uses vanilla extract, but you can also try almond extract. 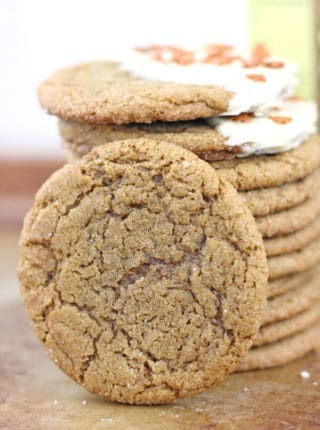 You can make these cookies using white or chocolate cake mix with 2 eggs and 1/2 cup of vegetable oil, then follow the recipe as directed for adding the pecans and caramel. 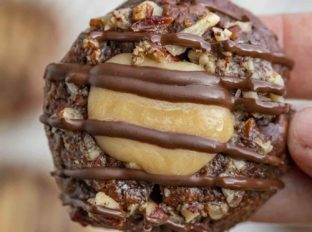 Turtle Cookies rolled in pecans, topped with caramel, and drizzled with melted chocolate are the PERFECT combo of sweet and chewy! To your stand mixer add the butter and sugar on high speed and cream until light and fluffy, about 2-3 minutes, then add in the egg yolk, milk and vanilla to the stand mixer until fully combined. In a small bowl sift together the flour, and cocoa powder then add it to the stand mixer with the salt and mix it in on low speed until just combined. Wrap the dough in saran wrap and cool in the fridge for a minimum of two hours (preferably longer) then when you're ready to bake pre-heat the oven to 350 degrees. Beat the egg white until frothy, about 2 minutes. Roll the cookie dough in tablespoon sized balls and dip into the egg whites before rolling in the chopped pecans and placing on the cookie sheets. Using the back of a 1/2 teaspoon measure make a 1/2 sphere indentation into the dough. Bake for 9-10 minutes, remove from the oven and press the measuring spoon back into the same spot immediately to form the circle perfectly again before it hardens and cools. Add the caramels to a microwave safe bowl with a tablespoon of water and microwave for 30 seconds until fully mixed and add 1/2 teaspoon to each cookie and let them fully cool. Add the chocolate chips to a microwave safe bowl and microwave for 30 second increments then when fully melted add to a small ziplock bag or piping bag and snip the end off to pipe a zigzag pattern over the cookies and let it cool completely before eating. These are so adorable and delish! Perfect little treats! Nothing beats homemade cookies anytime of the year, especially during the cold season! These cookies look amazing! Great recipe! The cookies turned out beautiful and delicious. Will make again. ? Having a few of these in front of me would definitely brighten my day! So good!